1 The simplest trammel is a single rod fitted into the base of the router and held in place by one of the fence bar clamps. 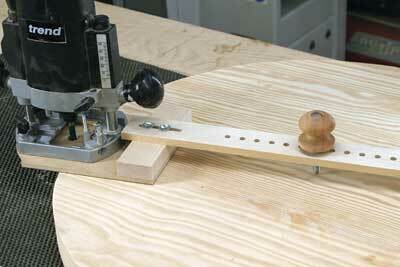 Make your own by drilling a hole through the end of a fence rod and using a nail as the pivot point. 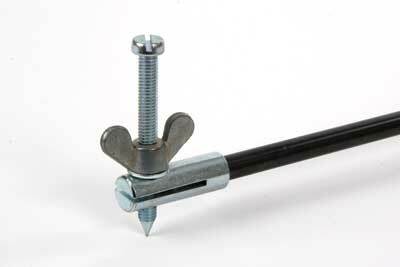 2 Alternatively, buy an adjustable point to fit over the end of a fence rod. 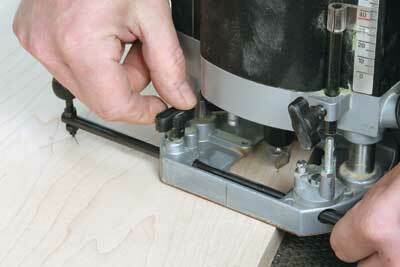 This arrangement allows the point to be raised and lowered above or below the router base. 3 To set the radius of the circle or arc, line up the cutter flutes with an axis taken from the centre of the cutter to the trammel point. Deduct the cutter diameter for cutting internal circles and arcs and add it for external circles and arcs, in both cases setting the radius between the trammel point and the nearest cutting edge. 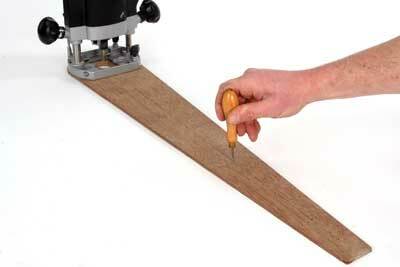 With some jobs the trammel can be located by simply pressing the point into the face of the work. 4 Where you don't want spoil the surface, locate the point into a thin piece of scrap timber temporarily secured to the work with double-sided tape. 5 If the required radius is much larger, a single-rod trammel will probably not be rigid enough and may flex in use, causing variations in the radius of the curve as the router is swung around. 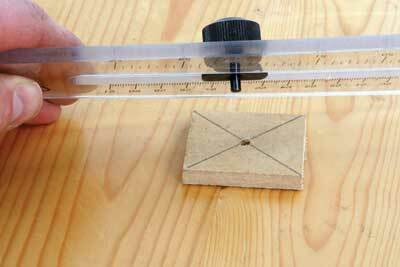 These circles are better cut using either a twin-rod trammel or a flat-beam version that incorporates a sub-base for the router, something you can easily make yourself. 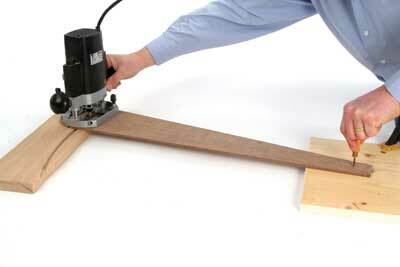 6 Alternatively, simpler ready-made beam trammels accommodate work up to about 600mm radius. Made of clear acrylic plastic with a graduated scale, these allow precise radius setting and the whole thing fits directly to the base of virtually any router. 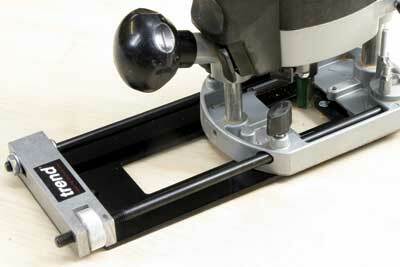 The width of support prevents any tipping and allows for a super-accurate cut. 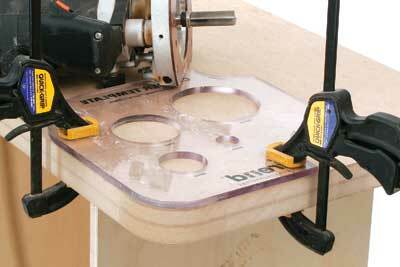 Make your own version using MDF or Perspex, with a pin or bradawl driven in the work as the pivot point. 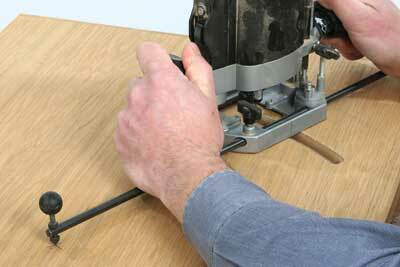 7 When you're using a trammel the router must swing smoothly, so always ensure that the centre point is securely located and only feed against the rotation of the cutter. 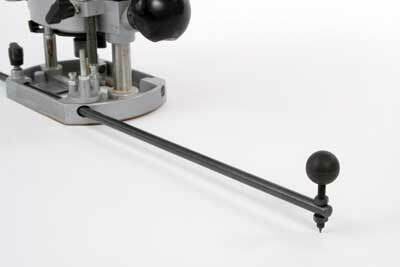 This braces any side force along the trammel rod axis rather than pulling away from the centre, which could possibly dislodge the centre point. The correct direction of cut is not always obvious, so remember to work anti-clockwise round the outside and clockwise round the inside. 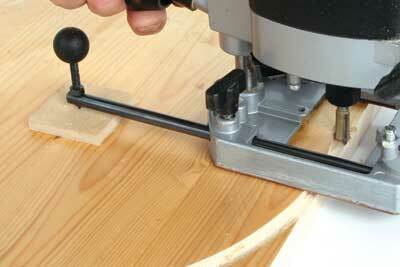 Consider cutting the curve on the top of a door panel: this is an outside shape so you need to cut anti-clockwise. However if you're cutting a hole in the front of the door this is an inside shape, and the cut needs to be in a clockwise direction. 9 Be careful that the trammel point does not enlarge the centre hole as you work because this will spoil the accuracy and prevent the cut matching up perfectly when you complete the circle. If you're making repeat cuts using the same centre point, it may be better to replace the sharp point with a small-diameter rod that locates in a matching hole drilled in a pad that can be stuck temporarily to the bench or the work. When cutting a complete circle, keep the cable out of the way by supporting it from a hook in the ceiling. To maintain a smooth and steady movement, swing the router as far as you can until your arms start to cross and then quickly swap them over to complete the cut, trying not to stop completely during the changeover, or you will leave a tiny burn mark. 12 ...or you could buy a template that is predrilled with holes of various diameters. Use this either with a straight cutter and guidebush, or in conjunction with a template profile cutter which has a top bearing. Although the pre-drilled holes are of fixed diameter, a variety of other sizes can be achieved from them by varying the combinations of cutter, bearing and guidebush. 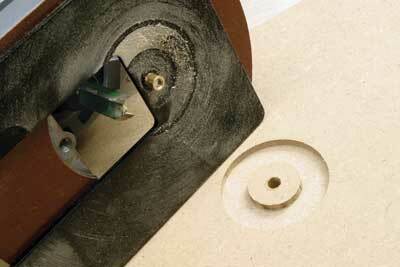 "The smallest radius you can cut is determined by the router base size"